Grey Goose has launched a limited edition Riviera bottle, which celebrates the brand’s French heritage and features work by famed illustrator, Quentin Monge. Depicting blue and white parasols the design encapsulates Monge’s “stylishly whimsical flair” and aims to be a simple reflection of the unique charm of the French Riveria. Speaking to TheShout about the bottle, Grey Goose Global Brand Ambassador, Joe McCanta, said: “Quentin Monge is an illustrator who grew up in the South of France, and he was inspired by the evocative image of the blue and white parasols in France. “When you see these by the seaside, it means you are on holiday. His idea was to take an iconic brand like Grey Goose and work to create another icon with it, and I think he has nailed it with the parasol. It just says summer and it says Riveria. For us it is about accentuating our main colour, which is the blue and using that icon nature to create something special. 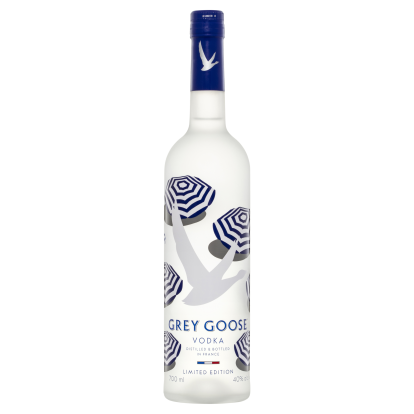 Containing the usual high-quality Grey Goose vodka, the limited edition bottle will be available to all retailers nationwide from 1 November, until sold out.